One size unisex style headpiece fits most children ages 4+, but will stretch to fit a *smaller adult size head. Child-sized Cute REINDEER ANTLERS HEADBAND measures approx. 8-inch (20cm) Tall. 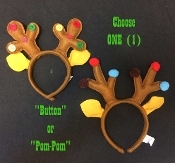 Our fun and festive fuzzy holiday themed headpiece features a solid chocolate BROWN felt covered flexible plastic headband with matching REINDEER ANTLERS and golden yellow ears, decorated with your choice of colorful plastic BUTTONS or fuzzy POM-POMS.